Whether you’re new to the keto diet, or are a keto devotee, there seems to be a never-ending collection of keto diet meals for you to enjoy. And if you haven’t tried your hand at keto instant pot recipes yet, you’re in for a treat. Keto instant pot recipes are quick, simple, and mouth-watering so you can enjoy your food without feeling like you’re on a diet. If you need a refresher (or an introduction), the keto diet is a low-carb, high-fat diet where the body produces ketones in the liver to be used as energy. Instead of producing glucose and insulin, which it does when you eat meals that are high in carbs, a ketogenic diet menu consists of mostly healthy fatty foods. On the keto diet, your body’s fuel supply switches to run almost entirely on fat, and it becomes easy to burn off your fat stores. The keto diet has helped many people lose weight and live a healthier lifestyle overall. It’s a diet that won’t deprive you, as you’re still able to eat delicious meals, such as these keto instant pot recipes we’ve rounded up for you today. While slow cookers have become a huge trend over the past few years, instant pots are a better, more convenient way to cook. A lot of steam is created during the cooking process, and instead of allowing the steam to escape, the Instant Pot traps the steam inside, pressurizing the pot. An instant pot has 6 main features: pressure cooker, slow cooker, rice cooker, steamer, warmer, and you can also sauté foods like vegetables. The instant pot cooks food at a very high temperature, preparing your food 70% faster than a slow cooker. This means you’re saving time and electricity when you use an instant pot. Have I convinced you? If you’re just starting to look into this awesome appliance, you may be wondering which is the best instant pot? Fortunately, you don’t need to spend an arm and a leg on this cooking tool. Try this budget-friendly instant pot to start making quick, delicious meals as soon as you can! Already hooked on instant pot meals? Check out these awesome instant pot recipe books so you never run out of ketogenic diet recipes for your instant pot! Have left overs? Invest in meal prep boxes so you can save them for another day. Want keto meal plans delivered straight to your inbox? Tasteaholics offers a monthly membership service that offers exactly that! Click HERE to learn more. If you’re following ketogenic cooking and are looking for keto diet recipes to make in the instant pot, check out these keto recipes you can make for weight loss. If you were wondering what to make on the keto diet, try these 50 recipes to satisfy your taste buds while working off unwanted pounds. 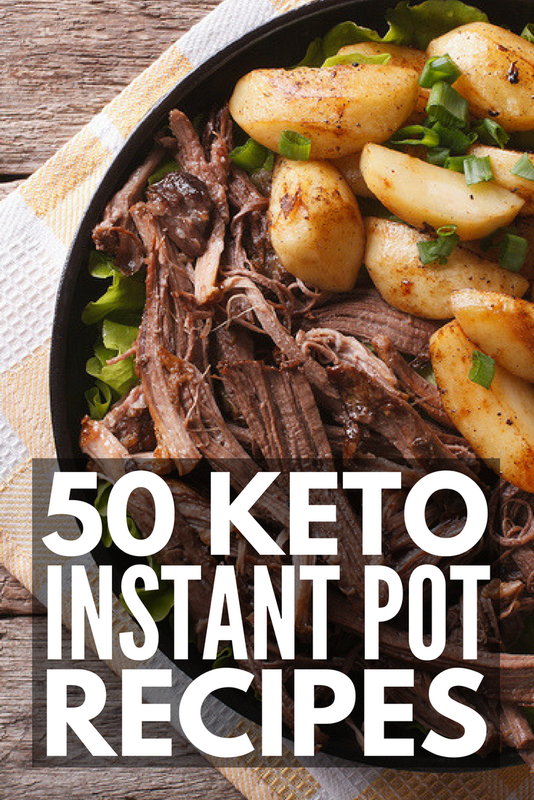 If you liked this collection of keto instant pot recipes, please share it on Pinterest! And if you’re looking for more on the keto diet, please follow our Health board on Pinterest!